Storytelling + Research = LoiS: Update to "Puzzled by the New Year's Possibilities?" Update to "Puzzled by the New Year's Possibilities?" Puzzles are great handouts for programs and a fun way to review learning. Here are a quartet of new ideas worth adding to my December 2010 post, "Puzzled by the New Year's Possibilities?" which looked at a variety of ways to make puzzles. Who hasn't looked at clouds and identified them as shapes? A favorite picture book is the 1947 book, It Looked Like Spilt Milk by Charles G. Shaw. If you Google the title you will find printables, lesson plans, a few YouTube videos, and a variety of activities. Its useful for teachers, librarians, and nature centers, but the sky isn't the only place the shapes of clouds may affect us. Have you ever seen or made a Wordle? Wordles produce a free-form graphic of the words you use. The creators of Wordle call it a "word cloud". Additionally some use it as a means of text analysis. 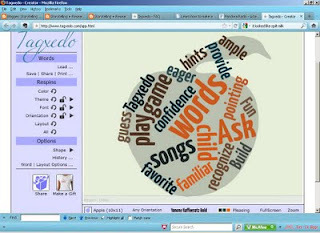 There's even a Wordle users forum, useful for solving problems such as coloring, printing, saving, or editing a Wordle. The forum goes beyond the site's FAQ to resolve such issues for more advanced uses. The creator of Wordle calls Tagxedo "Not so much an 'alternative' to Wordle as much as 'Wordle - the next generation'." Tagxedo takes those free-form shapes of Wordle and gives the option of using related shapes. On a personal note, I found getting to the shapes for Tagxedo at first a bit confusing. Here's how I finally created it. My sample uses those Early Childhood suggestions. I saved the words in a Word document before inserting them in the Create page. On Layout Options I chose Hard Boundary as it made the shape more obvious; White Friendly so the Tagxedo format would show up here; then Accept. Clicked the arrow next to Shape to see a wide assortment of simple shapes. If you create or maintain a website and would like a "rollover" word cloud for websites, Tagul is worth exploring. You can get various fonts, colors, and even a few shapes. Tagul has a blog to keep you aware of new developments, FAQ section, and a Forum for its users. Personally I prefer the simplest of rollovers to get to a specific page within a website, but a shaped word cloud on your homepage may be something you want to spice up a plain site. Don't be puzzled . . .
Storytelling is adaptable to almost any theme and talks directly to your audience. LoiS has a wide variety of existing programs or can create one just for you. A sampling can be found at Programs A to Z . Call 248-625-5848 or email LoiS-sez@LoiS-sez for more information.